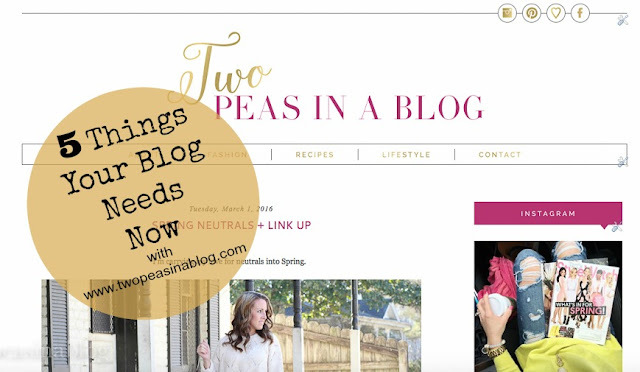 This week's blogger series is all about what we feel are the 5 most important things your blog needs to have now, besides great content of course!! This is all about the layout, design and additions you have on your blog to make it user friendly and easy to navigate through. Social media is major for bloggers to grow their brand and promote themselves. The social media icons should be located at the top of the page, easy for your readers to find. Make sure the link takes your readers to your social sites in a new window. We just recently started adding this feature to our blog posts. Readers want to quickly search through your blog and some posts won't appeal to them. As they are scrolling through the posts, they can stop and read whatever post strikes their fancy or keep scrolling. It doesn't sound like much, but this actually keeps readers on your blog longer!! Nothing is more frustrating than having to scroll through 47 blog posts to find the 1 you're looking for. This helps your readers search for exactly what they want to read about. Maybe a topic they saw on one of your social media sites or something they remembered reading weeks ago. Along with this is to have a list of archives in your sidebar, by month. It's so important to categorize content to make it easier for your readers to search your blog. Current readers and new readers can easily see what your blog is about - travel, fashion, recipes, DIY, etc. Also include a Terms & Conditions somewhere in one of these categories. We have ours located under the About tab. Always have a Home tab so readers can easily get back to the main page of your blog! You should not have more than 7 categories across the top. If you have more than that, consider creating sub-categories under one of those main 7. This brief introduction goes in your sidebar. This is just a quick 3-4 sentence introduction to your readers. Also include a picture. Your readers want to connect with you and put a face to what they are reading. You can go more in depth about yourself in an About category tab that opens in a separate page. Telling readers a little something about yourself helps them connect with you. We hope you found this post helpful and if you currently don't have these in your blog, you might want to really consider adding them. Let us know if you have any other items you think are a must for a blog. Great suggestions! I definitely think all these things are important! All great things to include! You should come share your latest beautiful outfits on my linkup, Katey and Betsy. Would love to have you there. Thank you and enjoy the weekend!